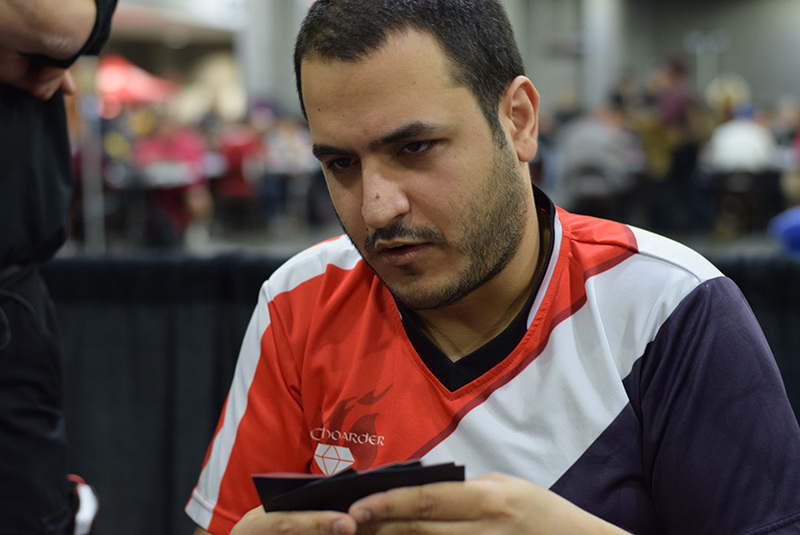 Last year was a pivotal year for old-school Control player Shaheen Soorani. He was frustrated forcing his control decks on formats that just weren't built for control. 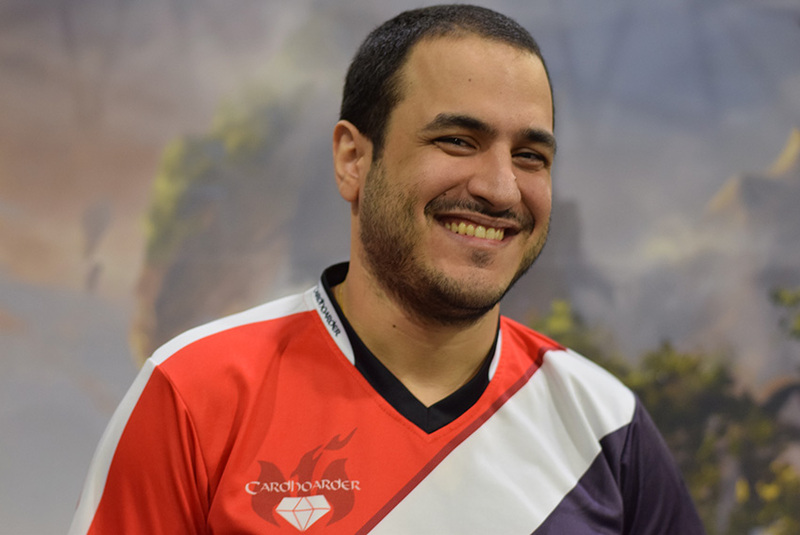 At one point, fourteenth-ranked Mike Sigrist took him aside and told him, "Shaheen, you're a good player, you just have to start playing good decks." 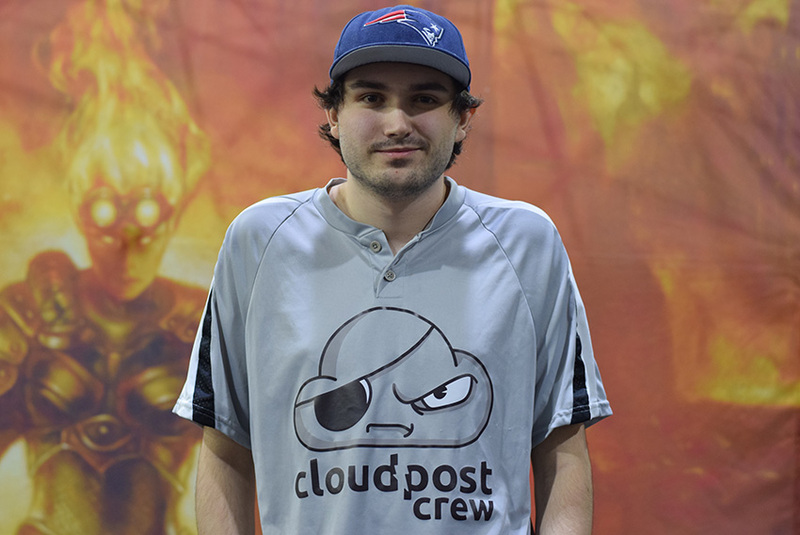 So Shaheen branched out—at the Pro Tours that year he played Mono-Red, Zombies, and Delirium twice. And he hated it. Oh how he hated it. He didn't do too well, either. So now, armed with the knowledge that other decks are stupid, Soorani 2.0 is back with a vengeance. Control is king and there's nothing you can say to make him change his mind. This weekend he brought Grixis Control—the same deck he played at the Pro Tour last weekend. Despite no one else in the room even considering the deck, Soorani went 8-1 like it wasn't a thing at all. And though often, even if Soorani does well with a control deck, no one else should try to follow in his path, Soorani thinks now is different. "No, but this time, it's the broken clock theory. It's really good right now," he insists. "With all the Temur Energy floating around, you just destroy it." He explained, "You can't go big against this deck, and they try ... They keep trying to hold up Negate or something, and I'm like 'Buddy, what are you doing? You gotta cast creatures! Live true to you.'" And that's Soorani 2.0's mantra—live true to you. At the last Pro Tour, he met Guillaume Matignon, another control master. He said, "Hey, aren't you Shaheen Soorani?" Soorani relayed that he said he was "one of them," a compliment that really meant something to that old salt. "I blame Sigrist for [last year]," he said, "And that's not happening again." In Round 8, Ben Stark played Brennan DeCandio, and showcased perfectly why his Ramunap Red evolution was working like gangbusters. His only red sources were Ramunap Ruins, so he was taking a lot of damage, and DeCandio was taking over the game, but then Stark flipped Treasure Map (yes, that Treasure Map) and grinded his way back into the game—something quite unlikely out of a regular red deck. But this was no regular red deck. Sporting one—count it, one—copy of Hazoret the Fervent, Stark is bringing a brew all his own, and ran the tables most of the day. It was reminiscent of his Grand Prix Memphis run a few years back. At the time Red-White was a dying archetype, but Stark single-handedly revived it by changing what the deck did out of the sideboard, going bigger in places that red is unlikely to grow. Stark said not to reveal too much of his tech before Day Two, as he says that's part of why it has been performing so well. But after a great performance on the first day, we'll get to see more of the innovative deck tomorrow. Aaron Leigh was nervous when he got to the Feature Match area Round 6. "It's my first Grand Prix," he said, "at it's a lot of pressure." 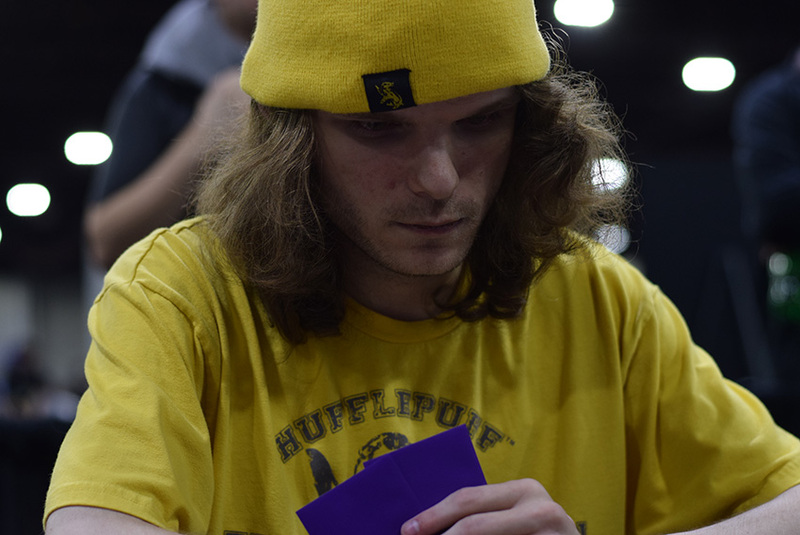 He was decked out in Hufflepuff gear—a yellow beanie and yellow t-shirt—and he soon got lost readying for his match against four-time Grand Prix Top 8er, Gold pro Ben Friedman. The Kissimmee, Florida native shuffled up, and when asked if there was anything he wanted the stream to know about him, he said, "Yes," he said with declaration. "Autistic people can be just as good at anything as people without autism; everyone should know that and try their best." And boy was he right. After a three games with his Ramunap Red deck, he took down Friedman hard, and shook his hand. "I won!" he exclaimed. Not only was this his first feature-match win, it was his first feature match, his first Grand Prix, and his first time outside of his home state. 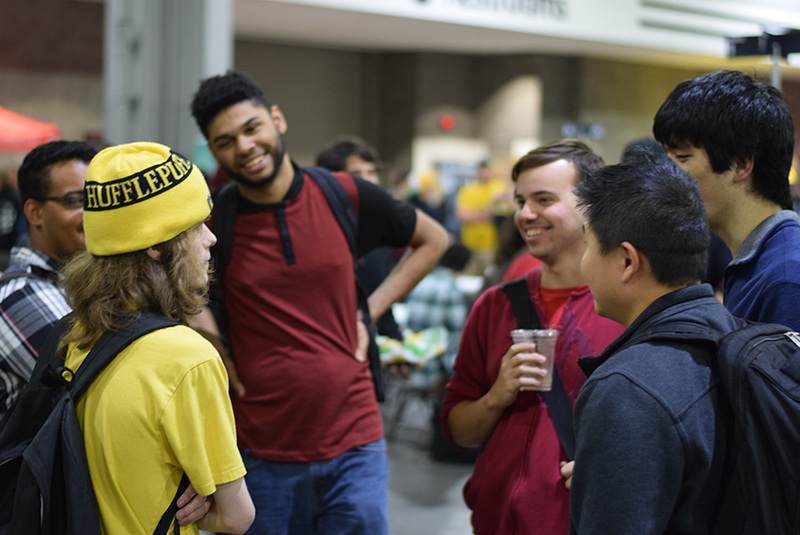 "My friends said that I always Top 8 FNM, so I should come with them [to Atlanta]," he explained. So he did. He thought this weekend would be a fun diversion, but it was turning out to be so much more. "I just started playing again this season. Even though I Top 8 FNM all the time, I couldn't even get enough Planeswalker Points for a bye yet." So he battled it out from Round 1. At 5-1, he was doing better than all the friends who made the trip with him. Though Aaron came back to the game recently, he started all the way back in Kamigawa when he was seven years old, when his father taught him. "He used to play all the time back in the Navy," Aaron said of his father, and he and Aaron bonded over the game, going often to local Florida events. Since that time he became a game vore—devouring whatever game he can get his hands on. When he's not gaming, he's studying for college, earning his degree in computer programming. "I taught myself programming when I was 16 ... It's a thing I like," he said, "but if I could choose a profession, it would be this—playing Magic, streaming Magic, just be here." He put his hands on the table and looked around the convention center. He soaked it in for a second. "I can't believe I won on camera against a pro ... wait, am I on stream right now?" When he found out his match was indeed on, he stopped to call his parents back in Florida. "Hey," he said, "I just beat a pro on camera and it's streaming right now! ... Put Dad on!" Aaron was having the time of his life. And he could use a good time this weekend. "Things have been stressful at home," he said. His brother is currently battling cancer—another close family member he used to play the game with—but who struggles now to find the strength to play. "I hoped this weekend would get my mind off things and to enjoy myself," and by the looks of it, he really was. Even though he admitted that feature match added to the stress he already works to contain, after the win he was feeling great, and started setting new goals for the weekend. "One Pro Point," he said. "I know it's small, but it's just a start; that's all it needs to be." Not a bad goal at all for your first Grand Prix ever. "I face a lot of discrimination," he concluded, "but I'm not too different from what we call a 'neuro-typical person' ... You shouldn't judge me based on my condition; you should judge me based on me." I, for one, was judging Aaron based on Aaron. He's kind, smart, and considerate. The type of person who apologized to Ben Friedman after beating him. And certainly Friedman was judging him based on his Magic skill alone—especially after that loss. Though Aaron lost Round 9, his win-and-in for Day Two, I doubt his spirits were down. He had an incredible first Grand Prix ever, and an incredible weekend. Marlon Garcia's path here was quite circuitous. He's from Venuzuela, but lives in Panama. He came to New York City for the marathon last week, then visited his family in Miami, the finally diverged back northward to come to this Grand Prix. "So here I am!" he said. On his giant achievement last week he said, "It was my first marathon—and I finished it ... It was great—all day, the ambience," he collected himself for a moment, "just everything, really. It was amazing. It's a once in a lifetime experience—everyone must do it!" 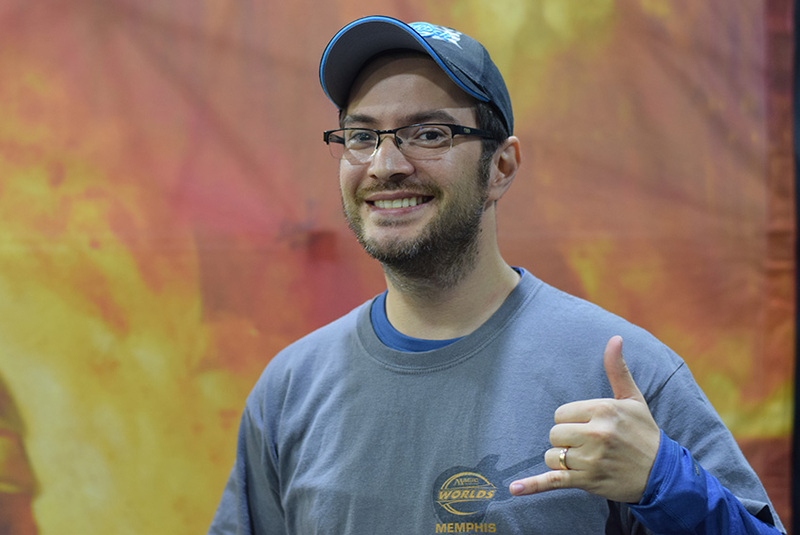 The two-time Venezuelan National Champion was excited about his finish at all, but especially because, "I didn't know anything about Standard until yesterday." He couldn't quite practice while he was practicing for the marathon, so he was behind the curve. "And this is my first Grand Prix this year." 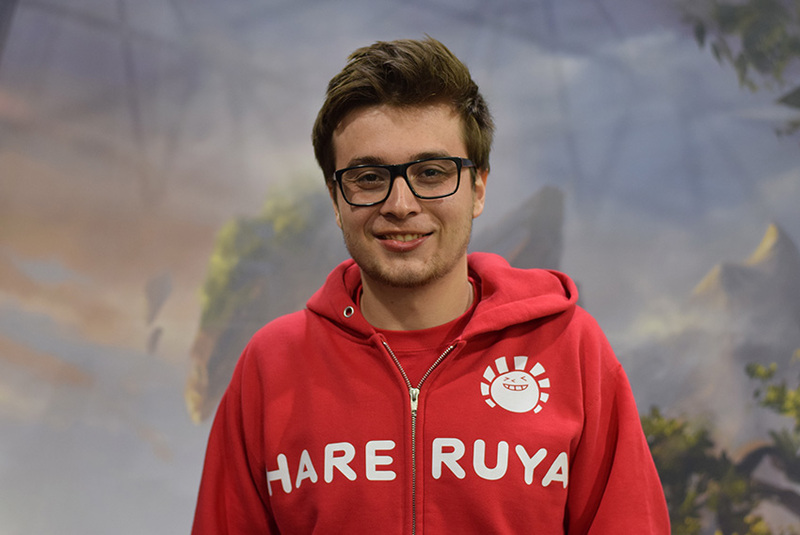 Garcia shrugged about his success with Temur Energy, saying, "If you can't beat it, join it." 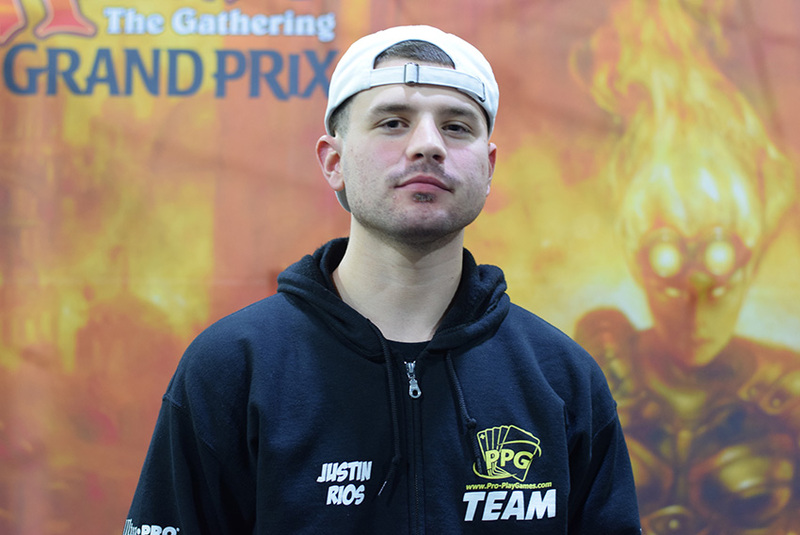 Justin Rios is a south Floridian player from Miami. He's been playing since Return to Ravnica. He's been to one Pro Tour so far, Eldritch Moon in Sydney, "and I cashed," he said. 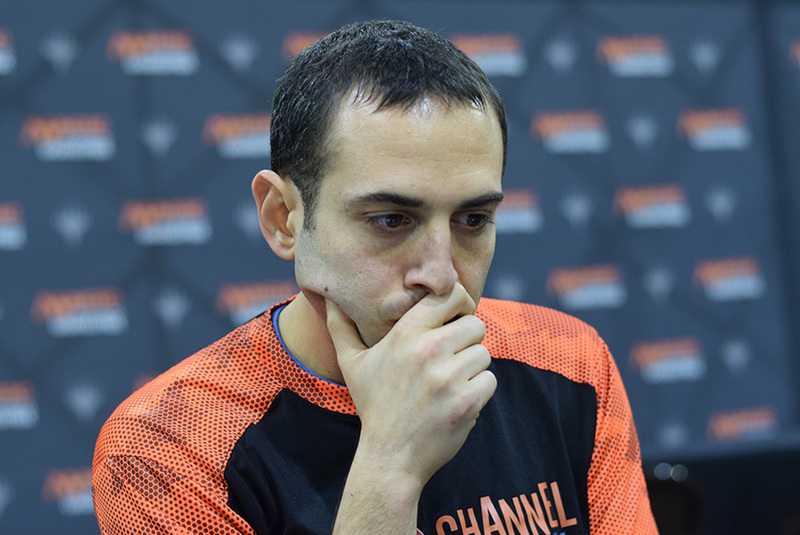 Rios cut his teeth, and honed his craft with his team Pro-PlayGames—and his constant playing partners Martin Culotta and Geddes Cooper (who Top 8'ed the last Grand Prix Atlanta). He said the team, and its leader, is always willing to lend out a deck, and help out where ever they can. He's hoping to represent them well into the Top 8 tomorrow, and keep Pro-PlayGames in the Top 8s of Atlanta. Trevor Coulombe hails from Farmington, Maine. He started traveling for Magic only in the last year or so. "I've been playing for a long time, but got serious pretty recently," he said. It would mean a heck of a lot to him to Top 8 and qualify for the Pro Tour because, as he relayed, "I'm pretty sure I'm the only one on my team whose never qualified before." The closest Coulombe's gotten was 20th place at Grand Prix Providence with Kyle Morrison and Slater Claudel. "So, the last couple years," he said, "after some of my friends made it on the Tour, I got that drive. I've made every single RPTQ since, but haven't gotten there yet. If I don't Top 8 here, I'll be at the RPTQ next weekend." He laughed as he said it, but he was dead serious. But with plays like he's been doing, he won't have to. He said his best game of the day was in Round 8. "I curved [Attune with Aether] into Servant of the Conduit, then turn-three Chandra, Torch of Defiance and turn-four Scarab God and another Servant." You might think that was it, but Coulombe wasn't finished yet. "I had an explosive start, then followed with Glorybringer, Glorybringer." He shrugged and said, "It's not fun to play a friend, especially when you're undefeated, but you gotta do what you gotta do ... Sometimes Temur does what it does." And sometimes you 9-0 because of it. Last up was Czech Republic's wunderkind, Petr Sochurek. 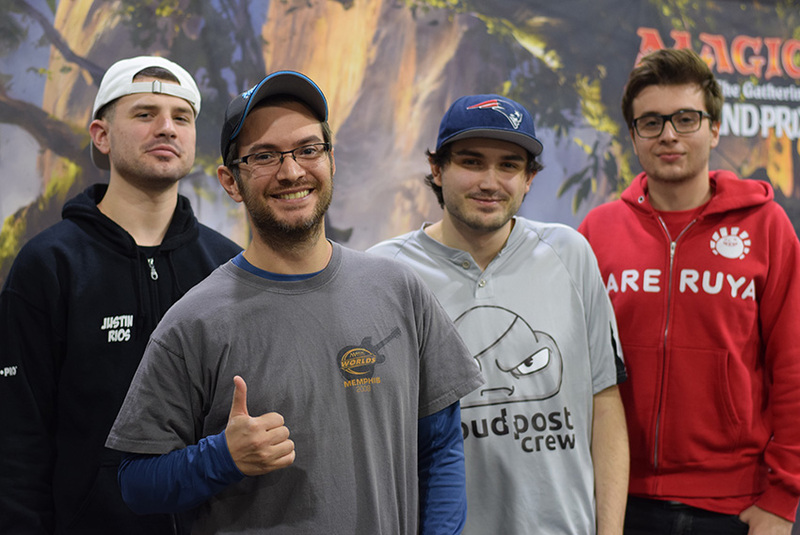 Fresh off the Pro Tour, Sochurek is just doubling down on what he already knows about the format, and was more than happy to wipe the floor with whoever got in his way. 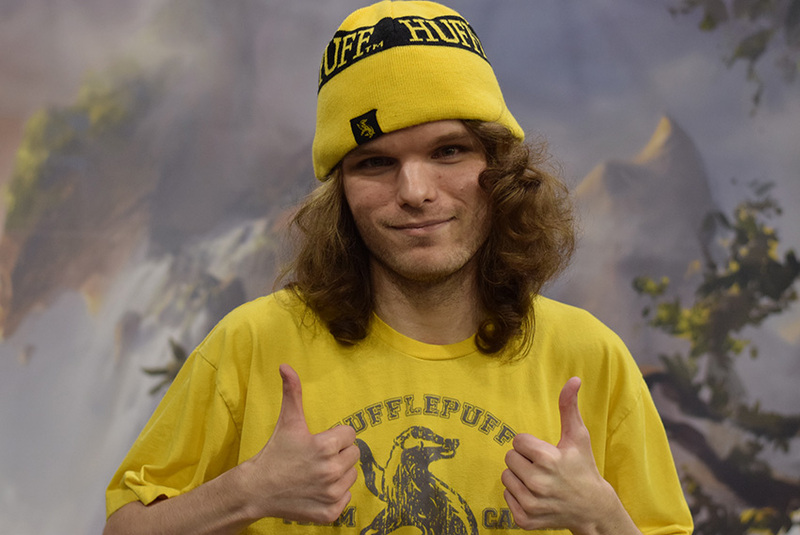 He feels like he has a pretty good handle on the format, and is pumped up on his sideboard tech—Hour of Devastation. "Yeah, if they save up their energy for Bristling Hydra or whatever, it's not good—but they never do. It's always, 'Make four Thopter tokens' or whatever, and I just wipe them all away." He said it's definitely been his all-star. "If there weren't any Sultai [Energy] here I wouldn't play it, but it's good against Temur and Four-Color too." We'll see if Hour of Devastation actually is the pseudo-mirror breaker tomorrow, when he's playing for the Top 8. That was the day here in Atlanta! And they'll be plenty more tomorrow.